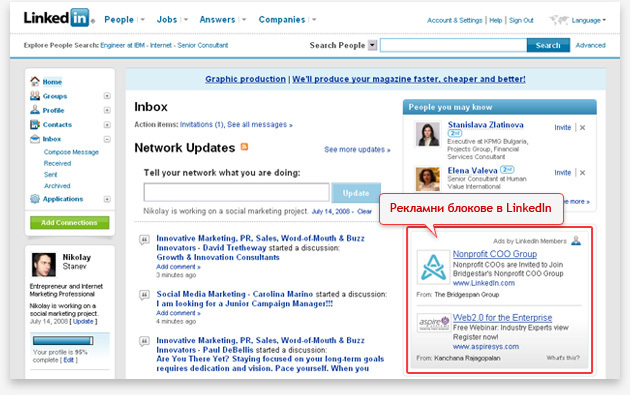 LinkedIn is the largest online community for professionals in the world. Its characteristic is that besides the personal profiles of over 45 million professionals in all fields, you can find many CEOs and senior executives from major companies. We hope that you understand how useful it is to reach them directly with relevant ads? Focus - can choose your audience on many different criteria such as seniority in professional, business, employee competence, size of company and others. Accessibility - you can create a pleasing advertisements low budget as you pay for clicks or (CPC) or based on 1000 impressions (CPM). Authenticity - can take advantage of the huge consumer confidence in LinkedIn, to build a professional image of your brand or product. Location - can focus your advertising campaign in selected geographic region or state, where is your target audience. Do not hesitate to contact us Publicity, to create and manage your direct ads on LinkedIn. Let's begin!